Adonis Sacre Coeur Hotel Roma, Paryż, Francja : Rezerwuj teraz! Adonis Sacre Coeur Hotel Roma is a comfortable 2-star hotel located in the Montmartre district, 18th arrondissement of Paris. Adonis Sacre Coeur Hotel Roma is set in an ancient Parisian building, offering a warm welcome and a friendly atmosphere, surrounded by impressionist painter colours. The hotel exhibits impressionist-style décor and some rooms offer views over the city’s rooftops. Staying at this hotel is truly an invitation to discover the French pictorial art of the 19th century. Staff at the 24-hour reception can provide tourist information, and a shuttle service is available from the hotel to the airport at a surcharge. A buffet breakfast is served every morning in the dining room at hotel Adonis Sacre Coeur Hotel Roma. 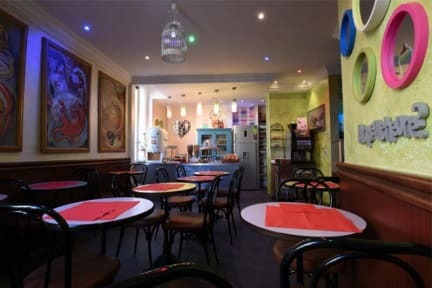 Adonis Sacre Coeur Hotel Roma is ideally located in the Montmartre district, 18th arrondissement of Paris. One of the best district to visit and relax during your stay in Paris. This hotel is a 10-minute walk from the Sacré-Coeur Basilica and just 25 m away from Lamarck-Caulaincourt Metro Station. Adonis Sacre Coeur Hotel Roma offers comfortable and well-furnished private rooms. A minibar, satellite TV and free Wi-Fi are included in each individually decorated guest room. Some rooms are air-conditioned. 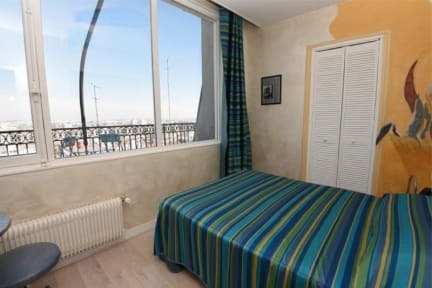 At the 7th floor, the property has 4 bedrooms, each with a terrace and an open view upon Paris, and decorated on the subject of Georges Braque’s work, who lived in the hotel in 1913.